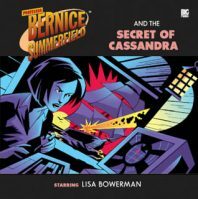 Beginning the second series of Big Finish’s Bernice Summerfield range that features all-new stories rather than adaptations of previously-published novels, ‘The Secret of Cassandra’ begins rather extraordinarily with a warship shooting down Bernice’s yacht and stranding her on an island. Taken aboard the Cassandra by Captain Colley who carries his own sad burden, Bernice soon learns of the secretive final movements of a brutal war centred upon this ship and begins to wonder if anyone or anything can really be trusted. Even if the notion of Bernice holidaying on this planet ravaged by war seems quite out of character, ‘The Secret of Cassandra’ does feature some strong central concepts, and Colley naming the ship after his daughter who died in the war gives an incredible amount of sympathetic depth to this man who would like to die himself after also losing his wife. Though never explained quite why, he places an implicit trust in Bernice and allows her freedom of his ship, and Lennox Greaves brings an instant air of respectability, likability, and weariness to the role that is captivating from the start. With Sally Faulkner’s General Brennan the voice of opposition who distrusts Bernice from the very start, a surprisingly substantial portion of the plot revolves around the distrust that these two have for each other, a fact that does rather stall the momentum at a few key points. With Bernice written as a far ruder and more impetuous character than ever before, the usual easy chemistry between leads that bolstered the first set of stories is sadly missing, and the relationships based more on what is expressed through dialogue than on emotion or actions fail to resonate for precisely that reason, even as the assumptions of Colley and Brennan are proven incorrect. Still, a prisoner that this ship who thinks of Colley as its father cannot detect is a clever twist that further fleshes out the danger of this conflict. Robert Curbishley brings the mysterious Sheen to life with the requisite air of mystery and danger, and his release brings with it a flurry of answers in a short period of time to offset the slower speed of the story’s development. Designed as a living bomb that could destroy an entire continent, Sheen houses a secret that is much closer to Colley than anyone could have ever anticipated, and his desire to die and to take all of Callibraxia with him becomes all the more personal as a result in a tense and emotion-fueled sequence. Unfortunately, ‘The Secret of Cassandra’ spends so much time building up the uneasy relationships among its leads after Bernice is rather haphazardly inserted into this ship that the war and its effects cannot be completely developed as much as a conflict of this magnitude requires, even as the titular secret of Cassandra is fully revealed. With characters that don’t quite spring to life as charismatically as usual even with the small cast and a sound design that is effective at times but overbearing to the point of drowning out dialogue at others, the production as a whole doesn’t quite feel as polished and well-rounded as the tales that came before it despite its genuinely intriguing premise and instead proves to be only a tepid introduction to what these new tales featuring Bernice Summerfield could hold going forward.